This year AJ has been learning all about modern history. Learning about things that happened only decades ago instead of hundreds of years ago has been really interesting to her. It is amazing how far our world has come in such a short time. Most of the topics we are learning about happened after my grandma was born. Knowing someone who was actually alive when wars and other things happened really puts things into perspective. One topic that AJ has really enjoyed learning about is the American Dream. And how that dream wasn’t easy for a lot of people. We were recently given the chance to review the book, Bessie’s Pillow by Linda Bress Silbert. It is an amazing book from Strong Learning, Inc. that is based on a true story of a young immigrant’s journey to America. I thought that the book would be a great way for AJ to get a better understanding of the personal side of history. It is easy to learn facts, but it is nice to get a look into how people felt and handled what was going on. AJ seems to enjoy books that are based on a strong female character, so I thought that she would enjoy this book. Bessie’s Pillow is a 276 page soft covered historical fiction book. It is broken into 40 chapters and includes a section called Bessie’s America. This section is full of historical information about the things going on in Eastern Europe that drove hundreds of thousands of people to immigrate to America in the 19th and 20th century. It also includes information about what America was like in that time period. The book is told in first person point of view. It starts off with 18 year old Boshka Markman waiting to leave her family and everything she knew to come to America. It was 1906 and Lithuania was no longer a safe place for her to live. At such a young age she would leave her family and make the long difficult journey to America on her own. Just getting to America was a challenge. There are numerous health checks and inspections to make sure she was healthy enough to enter America. Once she finally reached America she was told that her name would have to be changed to make it more American. From that day on she was known as Bessie. Bessie was a strong woman. We see her grow from a young 18 year old child to a strong wife and business woman. She faces struggles and overcomes them. She is kind, compassionate, and has a strong spirit. Just reading the book will teach you a lot about history. But the author has taken it a step further. She has created a site, Bessie’s America that takes learning about the time period to a new level. There are picture from the time period and tons of information about daily life back in the beginning of the 1900’s. There is also a teacher’s guide. The guide includes; discussion questions, a timeline of events, character analysis, themes, symbolism in the book and more. This book can easily be a jumping point for a full on history and language arts study. Unfortunately, when we were reading the book there were some issues with the website and the links were not working. Now that it is working, we have enjoyed looking through and learning even more about the time period. Originally the plan was to read a few chapters a day as a read aloud. After the first few days though, it seemed impossible to stop after a few chapters. The book was exciting and AJ didn’t want to stop reading. We ended up finishing the book in a few days. It was well written and really gave insight into what it was like to be an immigrant in America. There were a few difficult to read chapters, because lets face it, Americans were not always the most welcoming to immigrants. It is sad that Bessie had to face those difficulties, but I am glad that they were included in the book. I feel it is important to share both the good and bad parts of history. That being said, you may wish to read the book yourself before handing it over to your child. I think a 5th grader could easily read the book, but I know AJ would not have been emotionally ready to read it in 5th grade. She is in 8th grade now and the book brought up a lot of great discussions, especially considering all of the talk about immigration in our political world. 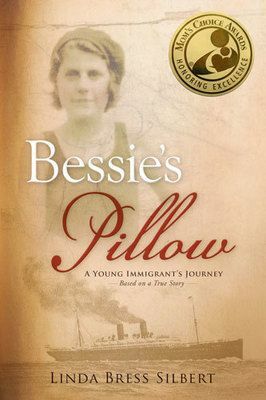 Overall, if you are looking for an exciting, well written, inspiring story of a strong female character who overcomes many difficulties, Bessie’s Pillow may be exactly what you are looking for. Find out what other members of the Homeschool Review Crew thought of the book by clicking on the graphic below.